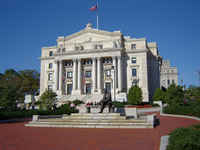 1st Street and East Capitol Street, Washington, D.C., Washington, D.C.
Cass Gilbert and Cass Gilbert, Jr. 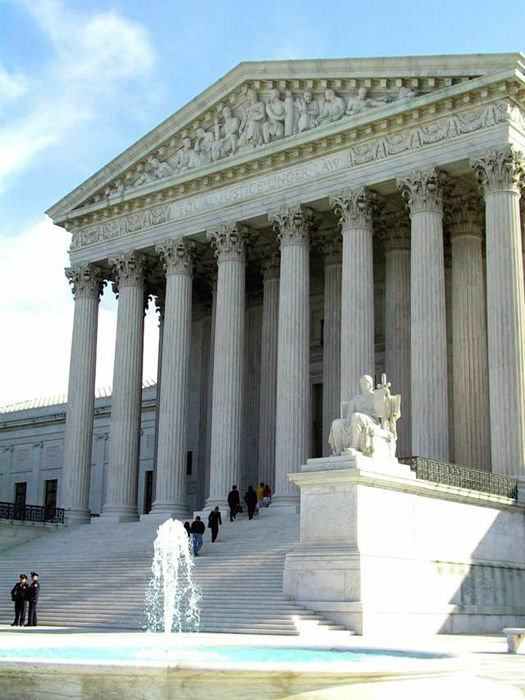 The relationship between the architecture of the Supreme Court and its landscaping is one of the most successful in Washington. The architect, Cass Gilbert, effectively disguised the irregular trapezoidal plot on which the building sits while totally controlling the approach, entrance, and passage through the building. The building is composed of three parts, a dominant temple of Roman derivation flanked by two wide horizontal wings. 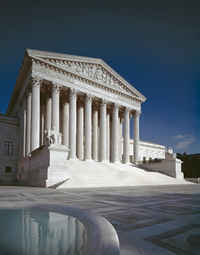 The temple, literally conceived of as the temple of justice, contains the most important functions, culminating in the Supreme Court chamber which terminates its 385-foot-long axis. The physical and symbolic pathway to this chamber begins on the plaza. A few steps above the sidewalk, a 100-foot-wide terrace—a square expanded by great apsidal ends—runs counter to the main east-west axis. The terrace is enclosed by the same low wall that surrounds the entire building and is paved in the gray and white marble pattern of alternating circles and squares seen at the Roman Pantheon. Immediately upon entering the terrace one encounters marble candelabra where low-relief panels depict Justice holding her sword and scales and the Three Fates weaving the thread of life. The bronze bases of the flagpoles there, designed by Gilbert and modeled by John Donnelly, Jr., are decorated with numerous symbols of justice (scales and swords, books, masks and torches, pens and maces) as well as the four elements (earth, air, fire, and water). At the closure of the terrace a full-story staircase draws one upward onto the dipteral octastyle portico. Throughout this entire processional route one is surrounded by white Vermont marble with an unusually high mica content. Reflections are so brilliant on sunny days that they almost blind the viewer. White glazed-tile roofs contribute to the luminous quality of the building. The opulence of these materials is complemented by the richness of the architectural and sculptural decoration and the intricacy of its allegorical theme. Atop the long cheek blocks of the staircase James Earle Fraser's stern seated figures, the Authority of Law (on the south) and the Contemplation of Justice (on the north), guard the temple entrance. Sixteen columns (and eight pilasters) are Gilbert's American variant of the Corinthian order where heraldic eagles are set between splayed volutes. The frieze of braziers hung with garlands (symbolic of the plenty existing in an ordered society) is particularly lavish. In the pediment, Robert Aitken's central sculptural figures represent Liberty Enthroned Guarded by Order and Authority. They are attended by six allegorical figures symbolic of Counsel and Research who were modeled after Americans responsible for bringing the Supreme Court and its quarters into being, although they are all shown in Roman garb. The muscular reclining figures at the edges of the composition are Chief Justice William Howard Taft on the north and Chief Justice John Marshall on the south, both shown as young men. Next to Taft, the architect Gilbert converses with Secretary of State Elihu Root while the sculptor Aitken attends to Chief Justice Charles Evans Hughes. The inscription in the frieze, “Equal Justice Under Law,” helps to explain how portraits of the architect and sculptor appear with those eminent jurists: the sculpture proclaims equality in American society while it reflects the artists’ optimistic attitude concerning the emerging role of the fine arts in America. The rarely noticed pediment on the east front depicts a related theme, Justice the Guardian of Liberty. Hermon A. MacNeil's central figures are representations of great law givers, Moses, Confucius, and Solon. 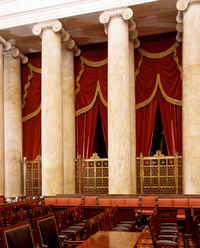 Their supporting figures are symbolic of the functions of the Supreme Court: Means of Enforcing the Law, Tempering Justice with Mercy, Settlement of Disputes between the States. In a secondary group is Protection of Maritime Rights, Pondering of Judgment, Tribute to this Court, and the Fable of the Tortoise and the Hare. This in-antis Corinthian portico, while less fully developed than the entrance, is symbolically important, as the chief justice's suite of rooms, directly behind it. The bronze entrance doors and the frieze of the Supreme Court chamber are the two major remaining foci of Gilbert's iconographical program, and they both depict the historical development of law throughout the world. John Donnelly, Jr., modeled the thirteen-ton bronze doors, each with eight panels. On the left the scenes are derived from classical historical and literary sources, the Shield of Achilles (Greek law), Praetor's Edict (Roman law), and the Justinian Code (religious law). The panels on the right illustrate events in Anglo-American legal history: Magna Carta, Westminster Statute, Coke, James I, and Story, Marshall. On both doors, the most remote events are at the bottom, and they move chronologically to the top as they move from laws themselves to their application or enforcement. Hence, like its neighbor the Library of Congress, the Supreme Court places American achievements within the broad continuum of human history. The office wings are raised on a walled podium. E-shaped, they are attached to the sides of the temple, creating four internal courtyards. These are highly developed architectural spaces with Corinthian columns or pilasters on all four facades as they are viewed from important rooms and were intended to be used as rooms themselves. The plasticity of the temple with its strongly three-dimensional architectural and sculptural elements contrasts markedly with the compact and restrained wings. Thin, unfluted Ionic pilasters barely break the wall surface; unframed vertical windows puncture it in a correspondingly shallow depth. Panels of low-relief garlands above the windows, the plain and planar entablature, and blind end bays all contribute to the shallow wall treatment and further emphasis the dominance of the temple over the wings.